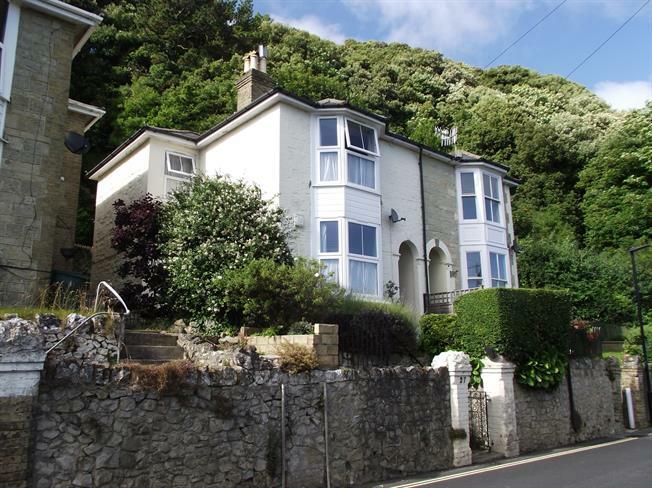 3 Bedroom Semi Detached House For Sale in Ventnor for Offers Over £210,000. Southerly aspect and sea views over rooftops to the front from this Victorian home situated at the top of the town. Some period features remain including doors and some fireplaces and there is a walk in pantry cupboard off the kitchen. The windows have been replaced in 2015/16 with uPVC double glazing units. Outside there is a courtyard style paved rear and side garden with a small front garden with steps down to the street. There is no onward chain with this home. Stairs to the first floor with under stair cupboard. Radiator. UPVC double glazed window to the walk in bay to the front. Radiator. UPVC double glazed window to the side. Matching wall and base units with tiled splash backs. Laminate work surface with inset stainless steel double drainer sink. Plumbing for washing machine and electric cooker point. Walk in pantry cupboard with uPVC double glazed window to the rear. Coloured glass skylight. Built-in cupboard. UPVC double glazed window to the front with views over rooftops to the sea. Picture rail. Radiator. UPVC double glazed window to the front with views over rooftops to the sea. Feature fireplace, picture rail and radiator. UPVC double glazed windows to the rear. Feature fireplace. Built-in airing cupboard with hot water tank. UPVC frosted double glazed windows to the side. Heated towel rail. Suite of panelled bath with electric shower over, pedestal wash basin and WC. External cloakroom facility with tiled floor, WC and washbasin. Courtyard style patio gardens to the side and rear with a small paved garden to the front with steps down to the gate to the street.